Earlier this year, AOL’s The Huffington Post and BroadbandTV announced a partnership to work on Outspeak, a “next-generation video network” for journalists and creators to put their work on both company’s platforms. 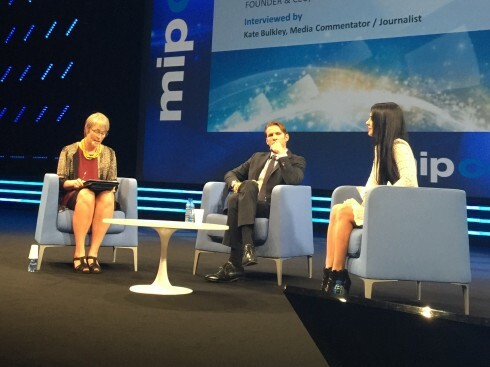 Today at MIPCOM, AOL’s executive vice president and vice president of AOL Content and Consumer Brands Jimmy Maymann and BroadbandTV’s chief executive Shahrzad Rafati held a joint keynote to explain their strategy, and the market conditions that influenced it. Journalist Kate Bulkley moderated. What are BroadbandTV’s international ambitions? It recently bought a child-focused MCN called YoBoHo in India, for example. “We’re the second largest video entertainment network in the world, but we’re also number one in Latin America and Brazil,” she said. Over to Maymann, who was asked about the recent acquisition of AOL by telco Verizon. “I don’t think it’s changed what we’ll be doing. It’s accelerated it,” he said. Bulkley asked about AOL’s budgets for licensing in video. “With the right idea, I don’t think there’s a limit,” he said. “Co-producing is something we want to do more.” But that’s not just with television producers: it’s also with the stars emerging from YouTube and other social platforms. Maymann talked about AOL’s live-video strategy. “We’re doing eight hours of live with HuffPost live, but it’s not [just] that kind of live. It’s those big live events: still things that you need to see in real-time, because social becomes really important,” he said. Rafati talked about the differences between the TV world and the online video world, and how a company like BroadbandTV makes the latter work financially. She cited some key factors. First: “cost effective premium content models” from having access to a network of creators that is scalable. Second; “Having a digital-first model online. When you’re programming for the millennials, you have to think about your content sitting on digital first,” she said. The conversation turned to Outspeak, the joint venture between the two companies, which was announced in June. How is it different from what someone like Vice News is doing? Outspeak is aiming to discover new talent in the citizen-journalism world, with the best “elevated and curated” across AOL and BroadbandTV’s networks. And he said it’s crucial to the business model of both companies given the ever-growing demand for video. “The Vice News’ of the world, they utilise a push model. And I think here we’re really building a strong ecosystem for journalism,” added Rafati.